In the first LFB match of the season Tarbes ran out winners (70-60) with some excellent shooting from behind the arc 10-of-17 from behind the arc. Liz Moeggenberg was the queen of the day with 5-of-5 in this exercise. She led the scoring with 19 points and was joined in double digits by four other players. Elin Elderbrink followed with 16 points while Frida Elderbrink and Isabelle Yacoubou-Dehoui finished on 11 points each. N'Deye N'Diaye contributed 10 points. 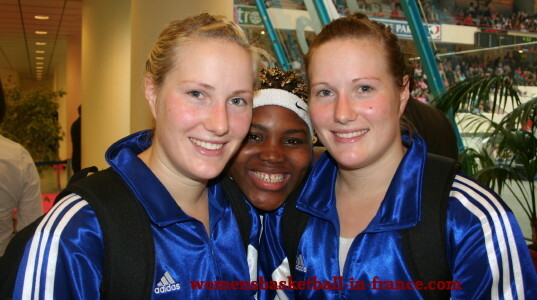 For Reims Amélie Pochet and Mame-Marie Sy-Diop scored 13 points each with Orsolya Englert adding 10 points. Interviews can be found with the Elderbrink twins, the Tarbes head coach and Berezhynska from Reims after the match report. 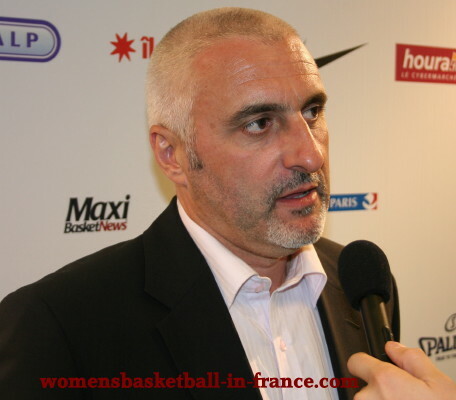 Reims had their first LFB match without their captain Marie-Laure Kindoki-Fleury. So the Elderbrink twins from Tarbes dominated the early possession as Tarbes looked for an early opening. Their persistence paid off as Moeggenberg put the first point of the 2008-2009 season on the board with a three-pointer. Yacoubou-Dehoui started to win the battle under the offensive boards and scored from inside. Tarbes also continued to fire shots from behind the arc with Frida Elderbrink and Moeggenberg to lead (13-8). Reims depended on Englert at the start of the match. 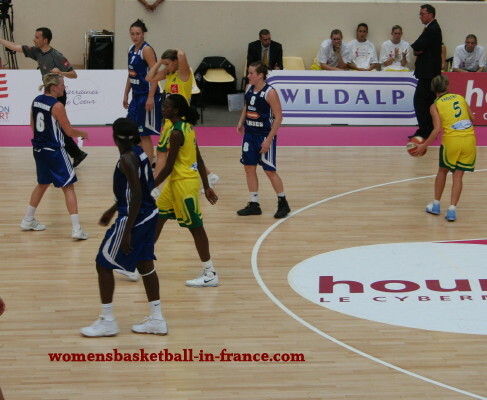 But once Sy-Diop started to find her way into the paint, Reims started to look dangerous. Tarbes continued to hit from the land of many. With excellent movement off fast breaks they stretched their advantage (23-15) by the end of the first period. The start of the second period was played at a quicker pace by both sides. Yet Tarbes were faster out of the starting blocks. A three-point shot by Pochet kept Reims in touch (20-28) and forced François Gomez to call a time-out. The pace slowed down as the game became rather techincal, at times scrappy with Tarbes maintaining thier advantage (38-32). Both coaches were not too happy and eventually a time-out was called. Reims finished the quarter better as first Sy-Diop found her way to the basket as she made something out of nothing. Then Lucie Bouthors came up with a shot from way behind the three-point line as the clock was winding down to score the last points of the first half. At half-time Tarbes' advantage was cut to a single point (38-37). N'Diaye led the scoring for Tarbes with 10 points while Pochet scored 9 points for Reims. 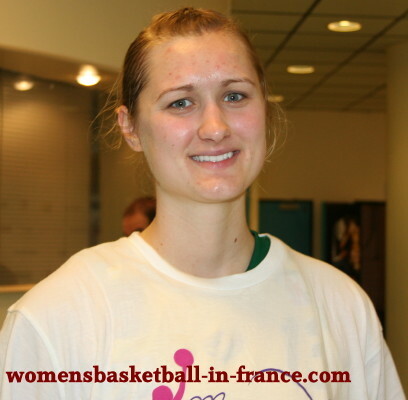 Tarbes found their shooting touch from far as Frida Elderbrink and Moeggenberg hit long shots from beyond the arc. While this was going on Elin Elderbrink was either scoring from inside the arc or dishing out assists as Tarbes opened a 10-point lead (53-43). Reims once again finished the quarter stronger and went into the final period with an 8-point deficit(48-55). Tarbes ability to hit three-pointers when required was enough to keep Reims at bay as they held on to their advantage (64-54) with five minutes to play. Valeriya Berezhynska's departure for 5 personal fouls for Reims marked the beginning of the end as Tarbes hit another three (70-58) to extend their lead with less than three minutes to play. Tarbes went on to win (70-60). François Gomez speaks in French about the positive points of the game. He was satisfied how the team recovered after a difficult second quarter. He also explained how important the interval break was because it gave him time to explain what needed to be done. Elin and Frida Elderbrink speak in Swedish and explain how happy they are to be playing basketball in France. They also talk about what they have just experienced in their first LFB match and how excited they are. Isabelle Yacoubou-Dehoui joined them for the picture. Valeriya Berezhynska speaks in English and explains that the whole squad has only played together for two weeks so it is a little hard but it will get better.